Temps have dropped here and I just want to snuggle up with a cozy bowl of oatmeal. 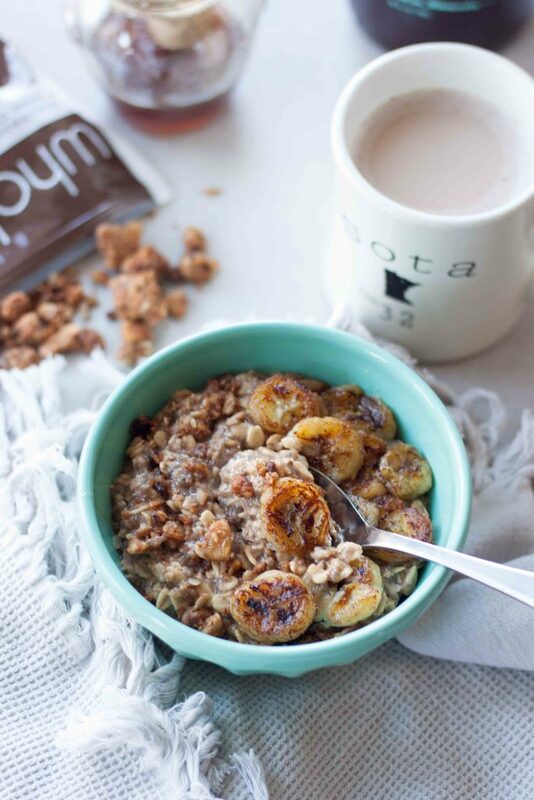 Not just any oatmeal Chai Chia Nana Oatmeal! This bowl is so comforting and has been hitting the spot and on repeat lately. Things have been a little different then previous years in that I’m not craving or crazy about pumpkin. Don’t worry I still have 2 pumpkin recipes coming for the pumpkin lovers and don’t get me wrong I still like it I’m just not craving it and not eating much. Yes my family has taken my temp and I’m fine. Instead craving more spices like cinnamon, ginger, chai, and turmeric which most of these are normal but just wanting them more than usual, and caramelized bananas! If you follow me on Instagram you know this because my love for them won’t stop and I’m craving them all the time. I like bananas but not a HUGE banana fan and don’t eat them often anymore, or wouldn’t normally grab a banana for a snack. Caramelized bananas are completely different and I could eat them every day, and have been lately. Even if you aren’t a banana lover you have to try caramelized bananas they don’t even compare to regular raw bananas. Really it’s like comparing chocolate to caramel or maybe more like creamy peanut butter to chunky, you can love one and hate the other! Not me, while I prefer creamy sometimes I get in a nutty mood. Don’t worry if you aren’t a banana fan leave them off or better yet peel and chop an apple and sauté that up with cinnamon and add those instead of banana! It must be the caramelized bananas changing my taste buds because while I love my Whole Me Clusters I’m not a big fan of the Cinnamon Banana Chip but I added them to banana bread a couple weeks ago and ended up eating the rest of the bag! 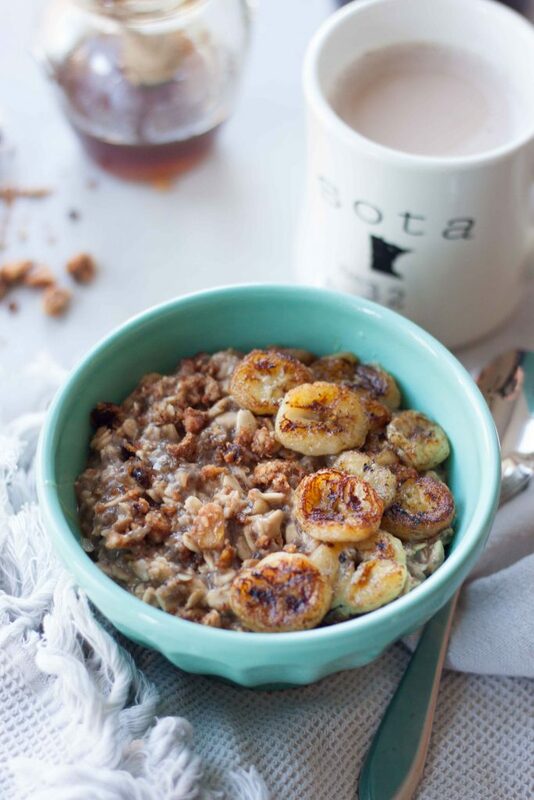 Then I added them to these oats that have been on repeat with the caramelized bananas and oh my goodness they were so good! Chai tea cravings come as the temps drop too, usually, some years I like it more than others but one thing it’s always good for… adding flavor to baked goods, oatmeal, ect. The warming spices of cinnamon, ginger, nutmeg, cloves, ect. It smells and tastes so good and screams fall. If you aren’t a tea fan or aren’t sure if you like chai tea pick some up and make a latte, if it isn’t for you then you can always use it in oats, smoothies, and baking. I will say there ones out there I like more than others, like coffee beans you might not like them all. I have a local favorite and a new chai concentrated I like listed below in the notes. Oatmeal cravings too as I want a warm breakfast on chilly mornings and oatmeal always fills me up and hits the spot. Oatmeal also makes a filling and healthy breakfast, especially with the added chia seeds. I fought the oatmeal cravings last month, or should I say had to combine them with my smoothie cravings and made some really creamy “SmOAThies” as I liked to call them but the girls weren’t fans of the name. If this flavor combo isn’t for you, or maybe you love it and want more inspiration check out my S’more Overnight Oats and Pumpkin Pie Overnight Oats Smoothie Bowl, or one of the many oatmeal recipes I’ve made over the year. If you like chai and coffee you might like my Dirty Chai Muesli Bowl! 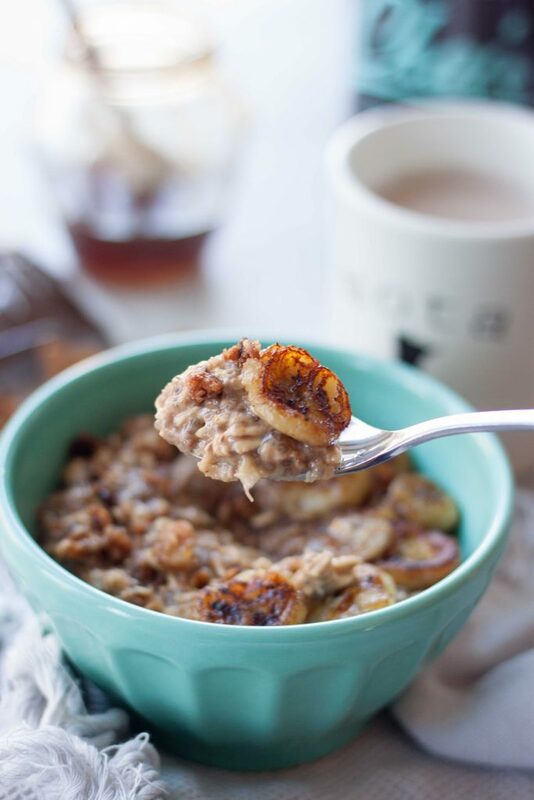 Chai, caramelized bananas, and oatmeal, this combo is so cozy and comforting and makes me and my tummy happy! 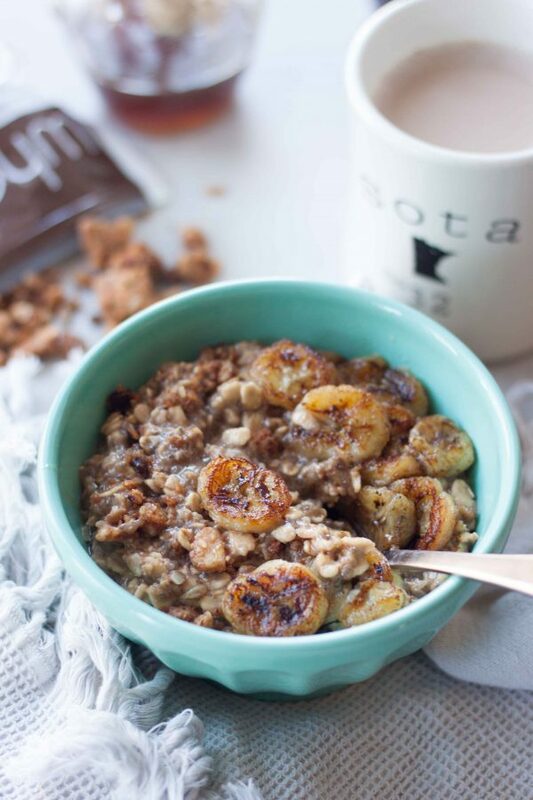 Snuggle up with a bowl of Chai Chia Nana Oatmeal, so cozy and comforting this healthy bowl always hits the spot! Quick and easy it can also be enjoyed, hot or cold, on the go to fuel your morning! Gluten free and vegan friendly. There are two ways to make this, first my quick and easy way and then I will share a stovetop method. Quick and easy I prep the oats the night before mixing the chai, milk, oats, and chia seeds in a jar and placing them in the refrigerator overnight. I use a glass mason jar. In the morning remove oats from the fridge, give them a quick stir, and heat them in the microwave until warm. While the oats are cooking and I'm making my coffee I caramelize the bananas. In a pan, I use cast iron, heat the coconut oil over medium. Slice banana lengthwise or into slices. When the oil is melted and the pan is hot add bananas. Once they start to turn a little translucent, about 1-2 minutes, flip them and cook the other side. Add a sprinkle of cinnamon if desired. 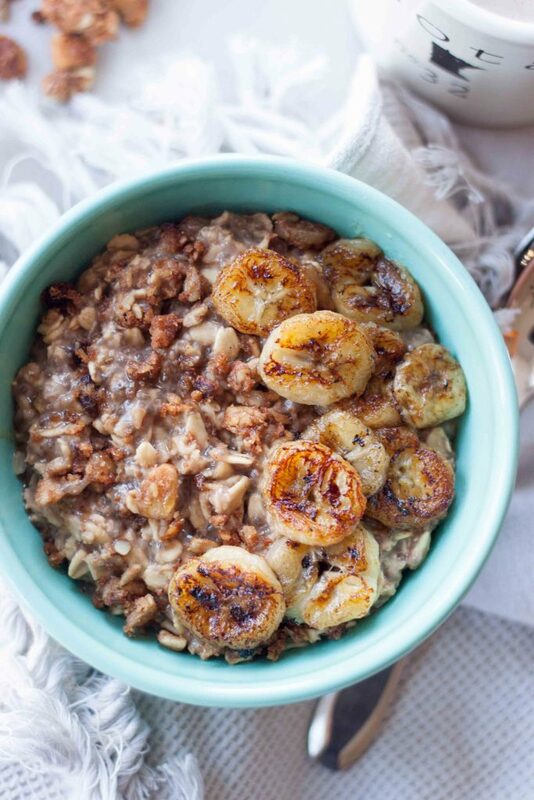 Here you have a couple options, either stir the whole banana into the oats, mix in half and top with half, or just top with the caramelized bananas. Add other toppings as desired. I like to stir in and top with a few Whole Me Cinnamon Banana Clusters and a drizzle of spiced cinnamon lately. I don't add additional sweetener to the oats when making them this way and don't always add the honey. If you plan to enjoy them cold you will also want to caramelize your banana the night before and add them on top of the oats for a grab and go. You can also enjoy this cold with warm caramelized bananas. Enjoy! For stovetop make cook oats per instructions using chai and milk instead of water. Stir in chia seeds at the end of cooking. Caramelized banana the same as above while oats are cooking. Assemble, top with toppings as desired. Enjoy! **For stronger chai flavor I use the 2:1 ratio in these. I also like to use a thicker creamier milk like homemade nut milk, cold pressed Juice So Good Cashew Bliss, or Ripple Plantbased Protein Milk. For chai I like to use local Gray Duck Chai (Burnt Sugar Ginger) or Unsweetened Bhakti Chai. Or you can sub 1 cup already prepared chai beverage (chai tea and milk). **Sub peeled and chopped apple in place of banana, a baking apple not a red delicious apple. ***If you want to add the Cinnamon Banana Chip Whole Me Clusters and can't find them at a local Whole Foods or want to order them you can use my code MISSWHISK for 20% off. This is my discount code as an Ambassador, I don’t make anything off the sale you just get them at the price I get them at if I order them and didn't pick them on locally. Those bananas look so good! Caramelized bananas are so delicious. This looks like such a wonderful recipe! What an amazing combo! 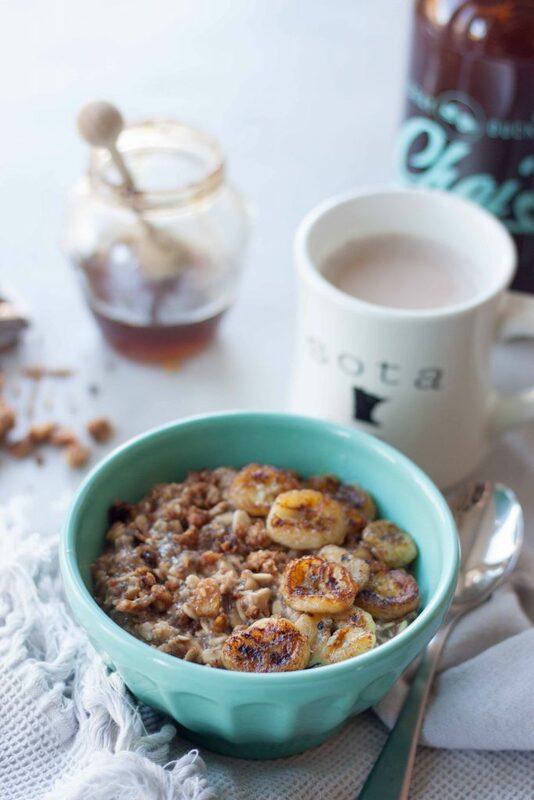 This sounds like the perfect breakfast to warm up to this fall! It’s bedtime but now my mouth is watering..haha. I’m just gonna go to bed so I can get up and eat this faster! Ooh, chai concentrate in there – that sounds yummy! I love the way you always cook the bananas Sarah. I never think to do that. Just look at those caramelized bananas! Yum! I’d love to start my day off with a bowl of this! Those toppings… it looks absolutely delicious! Alright, the next banana I buy, I’m going to caramelize because WOWOWOWOW!!! What a great breakfast option! I love chia seeds in my oatmeal! Adds that little something extra I love! This sounds so cozy and delicious! love that it’s loaded with chia seeds and chai. So yummy and perfect for a fall breakfast! I’m really digging those caramelized bananas. The perfect touch to these oats. Such a great recipe for a perfect start of the day! Can’t wait to start the day with it. Can I use coconut milk?